The Vaillant vSMART lets you control your heating and hot water anytime, anywhere from a single, easy to use app that is available for a your smartphone. 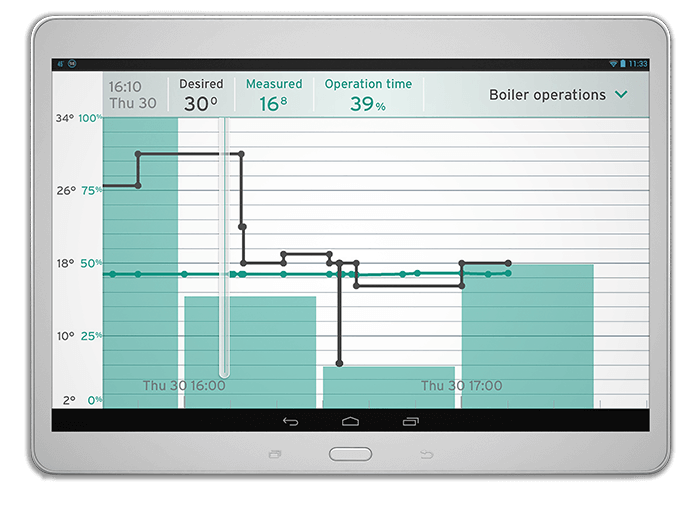 Compatible with the entire range of Vaillant ecoTEC boilers, vSMART supports modulating heating and enhanced functionality such as self learning or automatic heating curve adjustment. Meaning that every experience with vSMART is a unique one. Tell vSMART how you want your heating and hot water temperature and it will take care of the rest. From the moment you get vSMART installed, it starts to learn your homes heating needs. Using its smart weather compensation feature and utilizing weather data, the vSMART can tell your boiler how hard it has to work to get your home to your required temperature. As it learns what time you get up in the morning, up it will make sure you wake up to a warm and cosy home. Now that’s what we call smart! Have the Vaillant vSMART installed by a Vaillant accredited installer who will will ensure that it is not only set up correctly. But will also teach you how to use the app to get the best out of it, be on call should have any problems during the first month and will guarantee it for five years. Get the vSMART unit, professional installation (and clean up afterwards), training and the guarantee all for just £299. Call us now on 0141 578 1871 or fill in the contact form below.